The Hong Kong District Council (DC) Elections of early November 2011 have been considered as a major defeat for the pan-democratic camp in the territory and particular for the ‘radical’ democrats. Leaders of the League of Social Democrats (LSD) and People’s Power (PP) admitted that their strategies did not work and the mainstream media was quick to conclude that this would be the end to their ‘radical and confrontational’ tactics. Although the myth of the Hong Kong people’s political apathy has long been refuted, remnants of the ‘stability narrative’ have contributed to the conception that Hong Kong people have to voice their political opinions in a ‘peaceful, rational and orderly manner’. Although Hong Kong could best be described as a semi-democratic system without universal suffrage, the rule of law, civil liberties and freedoms are still guaranteed. This might have led to the consensus, among the administration, the media and the academic establishment that mass protests and Legislative Council (LegCo) debates are the ‘right’ way to articulate political options and any other forms of political activism are labeled as ‘radical’. Indeed, with the formation of the pro-democratic, grassroots oriented and left-wing LSD in 2006 and the subsequent election of ‘Big Guy’ Albert Chan, ‘Mad Dog’ Raymond Wong and ‘Long Hair’ Leung Kwok-hung to the 2008 LegCo, a more innovative, energetic and confrontational style of politics and campaigning entered the political scene. All three legislators are veteran politicians and social and political activists. Radio host Wong has strong personal and educational links to Taiwan. Government representatives, pro-establishment and pro-Beijing figures were quick to condemn the actions of the trio in the LegCo as rowdy behaviour imported from Taiwan. This value judgement has been readily picked up by the mainstream media and not challenged by the academic establishment, who wish to avoid any critical discourse of ‘Taiwanisation’. The following analysis is based on several years of continual and on the ground fieldwork, and extensive interviews with politicians from all political backgrounds. It is important to point out that Taiwanese politics is generally negatively framed by the mainstream media and the administration, particularly during the Chen Shui-bian era. Therefore connections of politicians and parties to Taiwan are frequently used to imply the creation of chaos and advocating separatism. In 2003 veteran pan-democratic lawmaker Emily Lau stated that Taiwan’s future should be determined by the Taiwanese people. This caused furious reactions by the pro-Beijing camp, asking for her removal from the LegCo and demanding an apology before ‘it is too late to regret’. Yet for observers of both Hong Kong politics and campaigns, the influence of Taiwanese election campaigns and strategies is increasingly evident. Election campaigning in Hong Kong is highly regulated. Campaign commercials in broadcast media are not allowed and expenses are capped at a very low level. Therefore newspaper advertisements are rare and appear only in the last 2-3 days before voting day. However, the colourful style of campaigning with flags and banners is reminiscent of Taiwan and pan-democratic parties have employed similar voter allocation strategies. Hong Kong’s political parties and researchers have sent delegations to observe Taiwanese politics and elections on a regular basis. The effects were obvious in the 2008 LegCo election campaign. Candidates from all backgrounds employed gestures directly copied from Ma Ying-jeou’s 2008 campaign literature. Indeed the Democratic Party (DP) produced a short Youtube clip which was inspired by the iconic KMT clip ‘The power to change’. The LSD fully embraced the entire spectrum of ‘Taiwan style’ campaigning. Taiwan inspired campaign elements included a large rally before the voting day, in fact the first of its kind in Hong Kong, the frequent use of gimmicks as well as the branding of its star candidates including comics, posters, and small toy figures. LSD candidates’ speeches were down to earth, spontaneous, filled with foul language and particular in televised debates, very aggressive towards the pro-establishment camp. The rise of the LSD can be largely explained by the frustration of a significant sector of society which feels alienated by the political establishment. The rapidly growing wealth gap in Hong Kong, steadily rising living costs and astronomical housing fees have been met by no effective, coherent and long-term strategy by the administration. In fact the Hong Kong government is perceived as increasingly unresponsive to the demands of the people without real public consultations and accountability as well as democratic progress (HKTP). These issues, its charismatic leaders and a sophisticated new media and social network strategy of the party contributed to the great support, particularly from young voters and followers. Taiwanese ‘theatre politics’ was subsequently introduced into the LegCo with Wong famously throwing bananas towards the Chief Executive, slamming the governments inadequate financial support of the elderly. The LSD split in early 2011, with Chan and Wong forming the de facto mirror organization the PP. Yet the tactics of both parties remained the same with the PP further increasing the pressure on the government through street blockages following mass demonstrations and a siege to the LegCo building in July 2011. The LSD’s Long Hair remarked that in fact these forms of resistance and theatre politics are not unique to Taiwanese politics during the early years of democratisation. Indeed these are common ways of questioning the legitimacy of existing institutions. Yet the success of Taiwan’s democratic movement, its advanced and sophisticated campaign culture provide an ample resource that can be easily accessed. 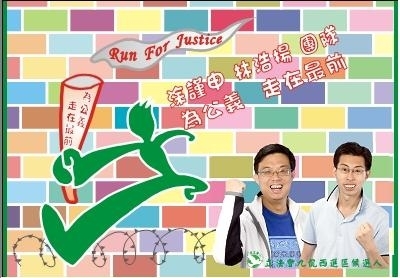 The recent DC election saw again frequent elements of Taiwanese style campaigning, for example in the design of campaign leaflets as well as activities. Here again the PP was a front-runner with its appeal to young voters. 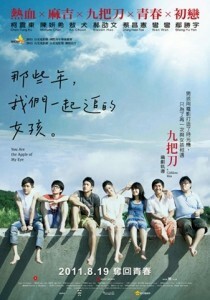 An interesting observation was the clear reference to the popular Taiwan movie ‘You are the Apple of my Eye’. The film’s poster was used as the basis for a campaign leaflet by a young candidate targeting voters in his age group. The Legislative Council Elections in 2012 will employ a different voting system, favouring smaller parties and ‘star candidates’. Hong Kong’s deep rooted social problems are also far from being solved or even addressed. Adding to the rising political awareness and participation of youngsters, the verdict on the fate of so-called ‘radical’ tactics is premature. It looks more like ‘Taiwan style’ campaigning is here to stay. Dr Malte Kaeding is Lecturer in International Politics at the School of Politics, University of Surrey.